This is shaping up to be an extremely busy 25 Hours for Toyo Tires as we pursue a fourth consecutive overall win. We look forward to working with long-time partner Flying Lizard Motorsports and new partners ShiftUp Now and Valkyrie Autosport. We are also excited to back three all-female car entries and support the road racing debut of Masato Kawabata, champion D1 Grand Prix drift driver. CYPRESS, CA – Toyo Tire U.S.A. Corp. (Toyo Tires®) and Flying Lizard Motorsports (FLM) return to the USAF 25 Hours of Thunderhill™ to attempt a fourth consecutive overall win. In addition, Toyo Tires is partnering with two additional teams, ShiftUp Now and Valkyrie Autosport, to demonstrate the quality and strength of Toyo products in endurance racing. Considered North America’s longest endurance racing event, the 25 Hours is one of the premier events held annually by National Auto Sport Association (NASA). Flying Lizard Motorsports (FLM) will have a two-car effort for this year’s 25 Hours, both equipped with Toyo Proxes Slicks. Competing in the ES Class is the No. 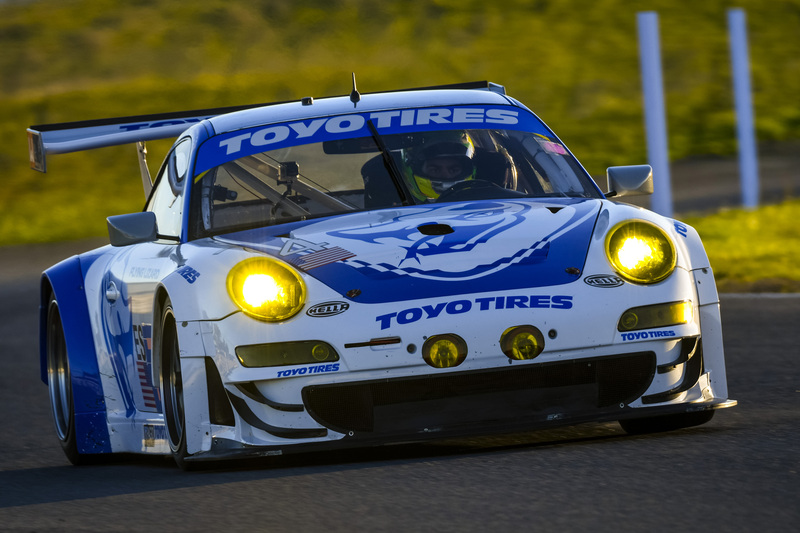 74 Toyo Tires Porsche® 911 GT3® RSR. The driver lineup for the Porsche includes Wolf Henzler, Johannes van Overbeek, Justin Marks, Charlie Hayes, and Andy Wilzoch. While the entire driver lineup consists of veteran road racers, van Overbeek holds the record for the driver with the most overall wins (five) at the 25 Hours – two being under the Flying Lizard banner on Toyo Proxes tires. An all-female team will pilot the second FLM car, the No. 45 Jester & Babbitt Racing by Flying Lizard Motorsports Toyo Tires Audi R8 LMS GT4 competing in the Toyo Tires® GT4 Challenge class. Drivers Christina Nielsen, Aurora Straus, Ashton Harrison, Laura Ely, and Erin Vogel will become the first women to compete under the Flying Lizard/Toyo Tires banner. Straus, Harrison, Ely and Vogel are US drivers; while Nielsen is an endurance racing veteran from Denmark. Harrison has previous experience with the 25 Hours, having raced it in 2017. In addition to the FLM cars, the all-female two-car team of ShiftUp Now is assaulting the 25 Hours. The pro-am driver lineup includes Pippa Mann, Shea Holbrook, Ashley Freiburg, Sarah Montgomery, and Amy Dilks driving a Mazda MX-5 Global Cup car in class E1. Mann is best known for competing in the Verizon IndyCar® Series. The second vehicle for team ShiftUp Now is a Spec E30 (BMW) entry with amateur drivers Lynn Kehoe, Karen Salvaggio, Mandy McGee and Kristina Esposito – all sharing the car for the endurance race. Both cars will compete on Toyo® Proxes® RR DOT competition tires. The #44 Valkyrie Autosport/Toyo Tires Nissan 370Z will be driven by National Champion Brian Lock, 25 Hour Veteran Giles Powell, Pro Driver Paul Terry, and new comers Sean Farrah and Nathaniel Rowland. To learn more about the Toyo Proxes line of performance and racing tires, and the full line of Toyo Tires products, go to toyotires.com. To learn about the USAF 25 Hours of Thunderhill™, check out http://nasa25hour.com/. The Lizards burst on the American Le Mans Series scene in 2004, competing in the GT class until 2012. In 2013, the team moved to the GTC class, still competing in legendary events such as the 12 Hours of Sebring and 24 Hours of Daytona. In 2014, the team expanded its program to include running two Audi R8 LMS in the TUDOR Championship, and in 2015, again expanded the program to include two Porsches® in Porsche® Club racing. Flying Lizard closed out the season with a dominating win at the 25 Hours of Thunderhill with Toyo Tires, a win they repeated with a 1-2 finish in 2016. Flying Lizard has also competed in the 24 Heures du Mans from 2005 through 2012, finishing third in 2005, fourth in 2006, sixth in 2008, sixth in 2011, and fourth in 2012.